You may have noticed we have been a bit quieter on the blog than normal, and that is because there have been some changes behind the scenes. Earlier this year, I (Brian) had the opportunity to take the next step in my full-time job, which required a move to Northern California. 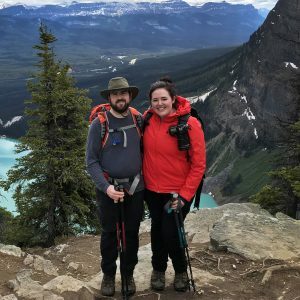 As two kids born and raised in Southern California, it’s been a big change for us to move to a new city. Though we are sad to leave our first home, we are so excited to explore the many destinations in our new backyard! Between the apartment search, moving day, and job hunting (for Julie), we have fit in a few adventures in the form of small day trips as we seek to keep the travel bug at bay. Here are highlights from a few of the places we have explored thus far. Enjoy! 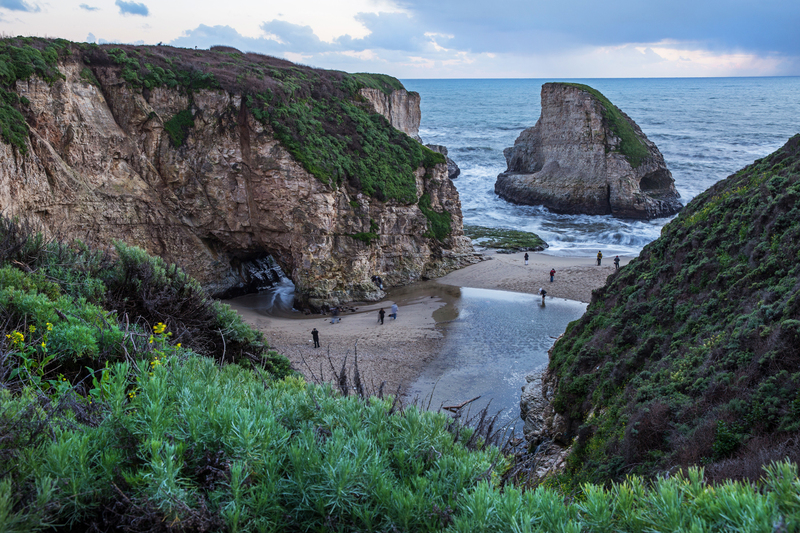 Just a short drive north of Santa Cruz, Panther Beach can be accessed via a short walk down from Pacific Coast Highway. The climb down to the shore is not for the inexperienced, but if you are up for the challenged, you will be rewarded with a stretch of sandy beach flanked by rugged cliffs that beg to be explored. 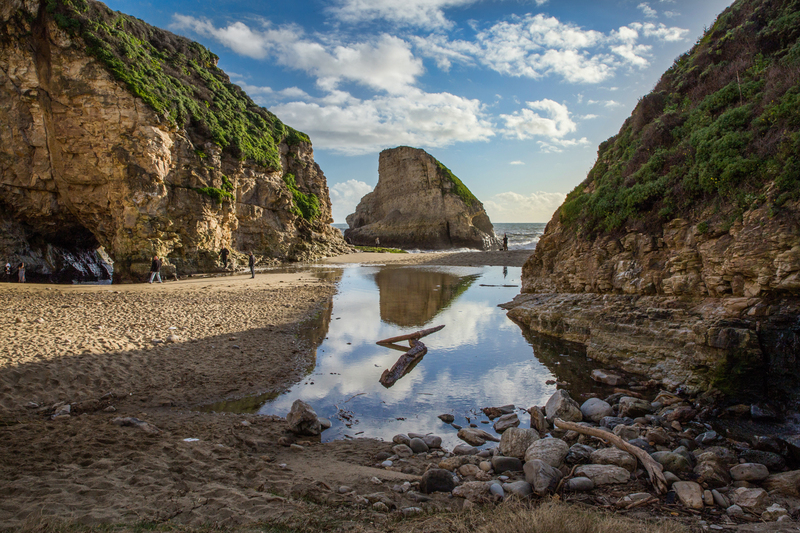 During low tide, be sure to check out the arch just to the left when you step onto the beach! 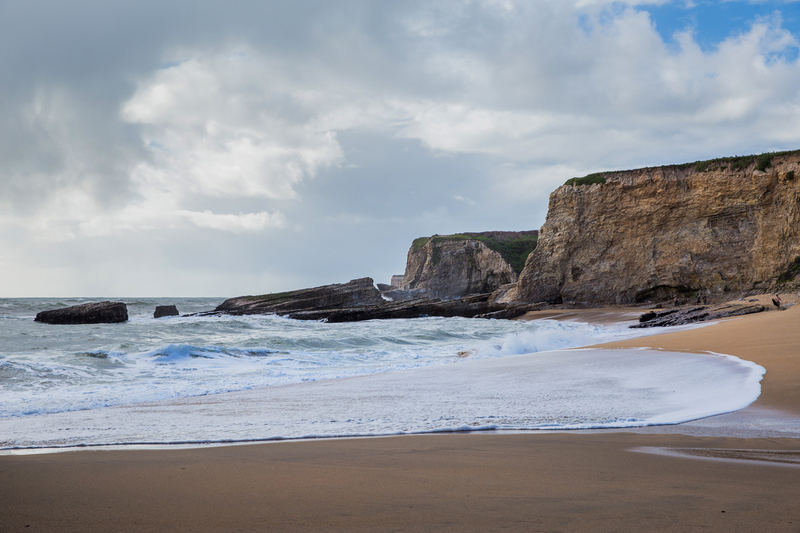 Continue north along Pacific Coast Highway, and you will encounter Shark Fin Cove, another must visit beach. Named for the large rock that looks well, like a shark’s fin! 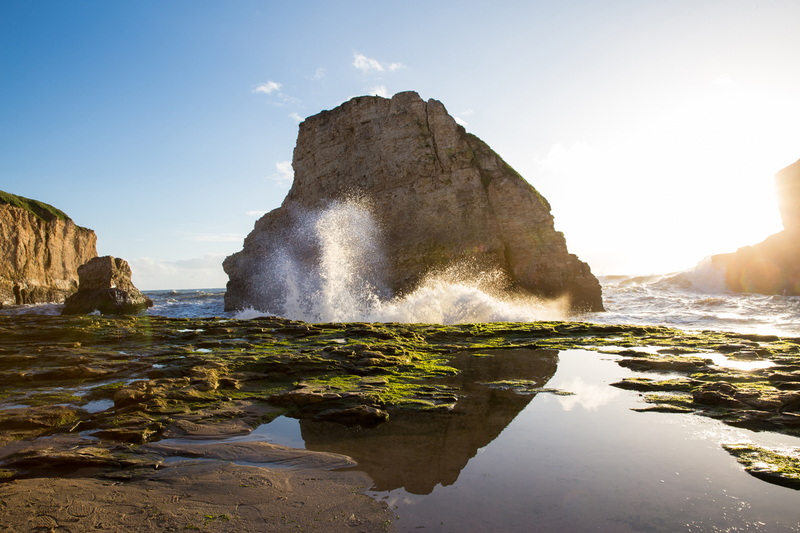 Make the short climb down to the beach for some awesome sunset photos. 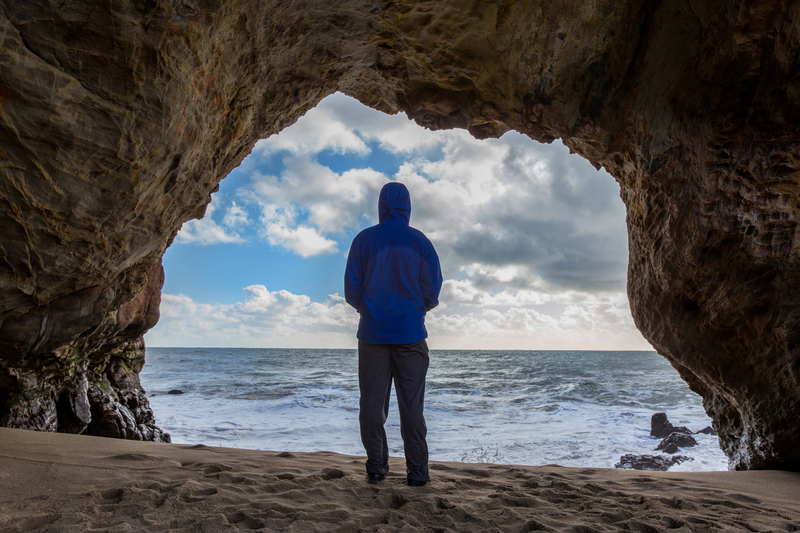 Much like Panther Beach, you will also find an open arch just to the left when you arrive. Recently, we were given the opportunity to become Storytellers for the Outbound, a site that focuses on outdoor adventures. It’s a great community that allows people to search, share, and review places to explore and outdoor activities in their local areas. We have a few past trips posted, and can’t wait to add more from our Northern California adventures soon! This week, we took a quick day trip to Sequoia National Park (post coming soon!). We have plans to visit our local State Park, Big Basin, and will be returning to Yosemite some time this summer. Stay tuned! Congratulations for the new opportunity. Looking forward to your new posts and beautiful pictures of places you went and to hear what you discovered in the Northern California. Thank you, Keng! We are looking forward to the new adventures and will be sure to share them! Thank you, Sandra! 🙂 Hope you all are doing well! Sooooooo cool!!!! These pictures are so beautiful and now I REALLY want to go to those beaches when I’m in the area! Thank you! 🙂 They are definitely worth a visit the next time you are up here! Love the photos! Awesome post! I’m from the Bay Area but currently live in LA. I really like your photos. 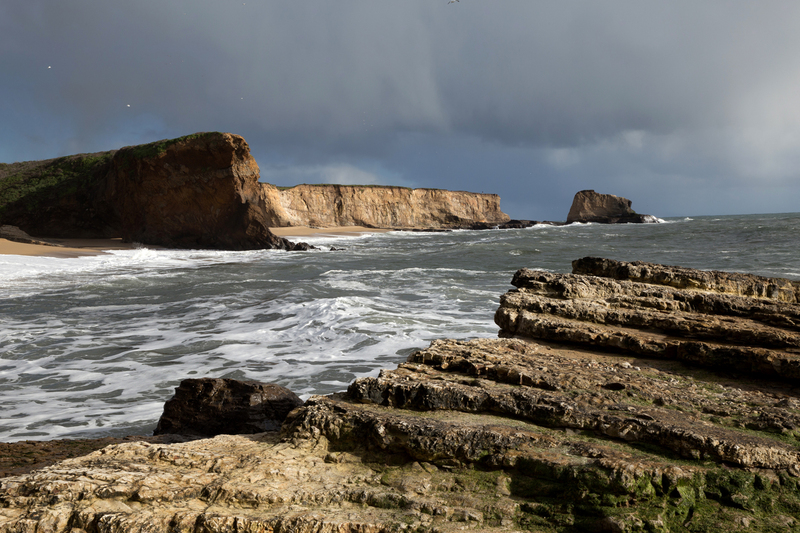 If you’re looking for other places to visit in NorCal, you should check out Lands End and Sutro Baths in San Francisco or Rodeo Beach in the Marin. Those are my favorites! Thank you, Lyvly Bee! We definitely appreciate the tips and will have to check them out here in the near future!